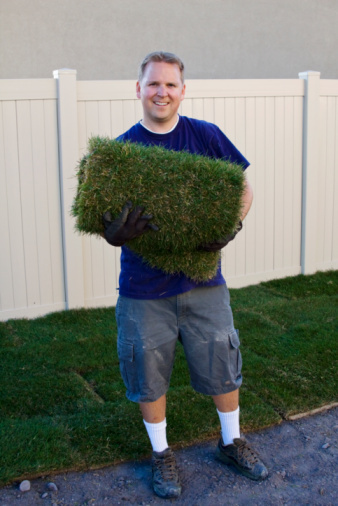 Whether you’re starting a brand new lawn or struggling to repair an existing one, installing fresh sod (or turf grass as it’s sometimes called) is often the best solution for a great looking yard. The more traditional method of starting from grass seed is less expensive, but it takes longer for seed to grow and the results are less predictable. With a sod lawn, you can be enjoying a rich, lush, green lawn in a matter of weeks vs. months. In addition, sod lawns have a pre-established root system, with new varieties that are more resistant to problems such as pests, disease and weeds. 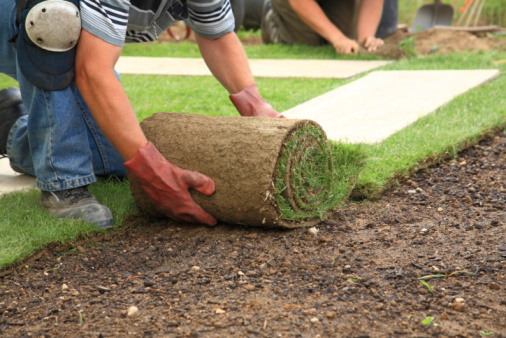 The key to sod installation success, however, is proper installation. The steps are not complicated, but the task can be labor intensive and time consuming – so get help and be sure to pace yourself. By following the steps below when installing a sod lawn, the results will be well worth the time and effort, enhancing your outdoor lifestyle and increasing your home’s curb appeal. 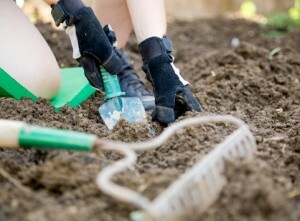 Taking the time to properly prepare the soil is a major factor in whether a sod lawn will turn out beautifully. The ideal foundation for sod will include aerated soil, compost, sand, fertilizer and, in some cases lime. Use a rototiller to loosen about 6 inches of dirt. Spread high quality compost over the loosened dirt. The compost should be about 2 inches deep. Next, add a 2 to 3-inch layer of sand. The purpose of the sand is to improve drainage. One of the best bits of advice for those laying a sod lawn is this: Get the soil tested. DIY kits are available, but pay a few extra dollars and have the soil professionally tested. After performing the soil test, add fertilizer. Some will need to add lime depending on the results of the soil test. A very common mistake when laying sod is failing to level the ground. This can cause the lawn to look bumpy and uneven and can, in some cases, cause the seams to be easily visible creating a patchwork quilt effect. Simply use a rake or similar tool to move the soil around enough to fill in the low spots and bring down the high spots. Once the ground is level, water sparingly and you’ll be ready to start laying the sod. Anyone who has had a mishap when trying to lay tile knows this: How you start will have a huge impact on how the finished project looks. The same is true when laying sod. Identify the longest straight patch in your yard. This is where you will lay the first roll. For the first roll, use the entire length of the sod. Once it is down, you will need to remove air pockets by patting it down gently. You should avoid stepping on the new sod, but if you do, use a rake to remove any footprints. For the remaining row, you will need to cut each length of sod in half. Stagger the placement of the shorter seams of the sod. Think of a brick wall to get the idea of how this should look. Be sure the seams are nestled snugly together, but they should never overlap. Cut away at the sod as needed when placing around trees, flower beds and other features. Once the new lawn is installed, proper care – especially in the first few weeks – is essential. 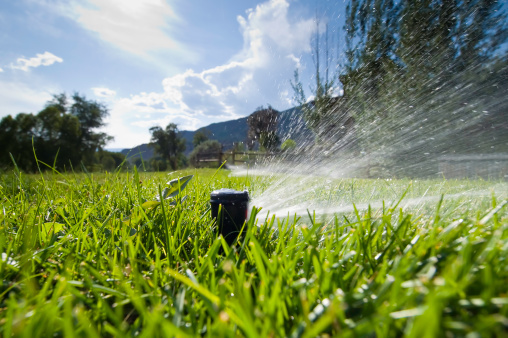 Immediately following installation you should water the new lawn completely. Do not allow any foot traffic (including pets) for at least one week. Water every single day for the first week, every other day for the second week and twice a week after that. NOTE: In most southeast climates, the best time to water the sod is in the morning. Do not mow the lawn until it reaches at least 3 inches. Then you can mow down to about 2 inches. Until the sod is established, use a lightweight, walk-behind mower. The weight of a riding mower could damage the sod. It is a good idea to add another round of fertilizer after about a month. 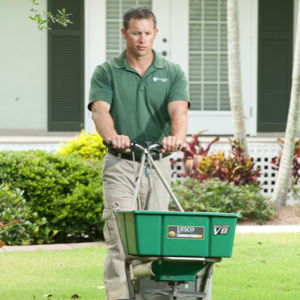 Consider hiring a professional lawn service company to help protect your new investment. If the task of installing a new lawn seems too overwhelming, or physically demanding, consider hiring professional lawn installers to do the job. With proper planning, pacing and preparation, however, you can successfully install a beautiful and healthy lawn. Instead of months of waiting for a seeded lawn to fully mature, you can relax and play in your new sod lawn in a matter of a few short weeks. Did you know? Harmony sod is grown to exacting standards utilizing the best available grass varieties for your region? Harmony is available at all major home improvement retailers nationwide. To find the location nearest you, click here.